Bordeleaux is one of the founding dukedoms of Bretonnia, occupying the western coastal region just south of cursed Mousillon. The current duke is the courageous yet stern Alberic, known for his strict adherence to the rules of chivalry and the preservation of the natural order. Knights trained under Alberic are among the very best Bretonnia has to offer, showing almost suicidal levels of bravery on the battlefield – never shrinking from an opponent, no matter their size or reputation. 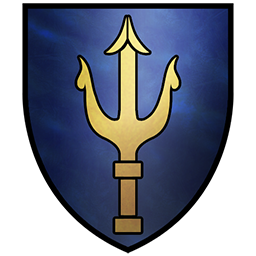 Duke Alberic’s coat of arms bears the distinctive Trident of Manann, the Sea God, who watches over Bordeleaux’s coastlines and vies with the Lady of the Lake for the affections of its people, such is his importance in the region. Certainly, along the sea routes and among sea-borne traders, Manann is considered the more popular patron-god. Legend has it that Alberic’s ancestor, Duke Marcus – one of the original Companions of Gilles the Uniter – himself fought alongside the temperamental sea god; apparently, the pair expelled raiders from Bordeleaux’s coastlines together, restoring peace and allowing trade to flourish once again unhindered. Duke Alberic's bravery and strict self-discipline is well known, and naturally he expects his Knights to reach the same high personal standards, even going so far to dismiss and expel those who err or fail to meet them. This means that Alberic has the smallest Ducal household in the Kingdom, but one that is nevertheless a force to be reckoned with and containing some of Bretonnia’s greatest Knights. Unfortunately, circumstance has thus far prevented Alberic from achieving his life’s ambition – to embark upon a Grail Quest. For this to happen, a suitable successor must be found so that Bordeleaux may continue to flourish in his absence. Despite his advancing years, the Duke remains hopeful that a candidate may yet emerge, enabling him to leave his ancestral seat and search for the holy chalice of legend in the Lady’s blessed name!